The process of getting a city like San Francisco ready for the known threat of earthquake seems quite different from getting a city like Medellin ready for the disruptions that come with urbanization and globalization—including crime and rapid growth—but, in fact, both involved structural actions. Over the years, Medellin had tried to face its threats in many ways. To reduce the chronic stress of crime, they had staged military interventions against gangs. They had arrested and incarcerated drug traffickers and murderers until the jails were bulging, but the inmates kept right on doing business from behind bars. Then Medellin focused on a single, specific vulnerability that, if addressed, might make the city more ready to manage further population growth and enable its citizens to pursue new livelihoods as businesses came in. The vulnerability was the lack of mobility, poor accessibility, and extreme isolation of the poorest and most vulnerable communities—the barrios—especially those that had sprung up on the steep hillsides. We know that fractured communities are vulnerable ones and that disruptions, such as violent crime, affect them more than others. Isolated people don’t know one another and are less likely to share information about what is happening or generate ideas about actions to take. Disconnected communities can’t pool resources and have a hard time coming together in groups and are thus more vulnerable to being threatened, bullied, terrorized, and taken over by gangs. To address this vulnerability, Medellin’s solution was to design and build its extensive public transportation system. The Metro, which began operating on November 30, 1995, has two rail lines, two bus rapid transit routes, and three cable car lines—small in comparison to the transportation systems of cities like London or Buenos Aires or Tokyo, but a major infrastructural development for Medellin. Now the majority of residents have low-cost access to all areas of the city (one ticket, valid for ninety minutes, connects riders to all transport modes and costs around 1800 pesos, or ninety cents), so they can pursue opportunities that were previously out of reach. The Medellin Metro is more than a transportation network, it’s a striking example of what is known as “transit-oriented development”—an area that integrates transportation lines and stations with commercial enterprises, private residences and public housing, institutions, and public spaces. The idea is that mobility is fundamental to city life and that transportation infrastructure should be as much a part of the designed cityscape as are buildings and streets. The Medellin Metro connects a wonderful sprawl of community centers, health clinics, and training and youth-oriented facilities, as well as popular libraries located at the main transfer stations of the cable car network. 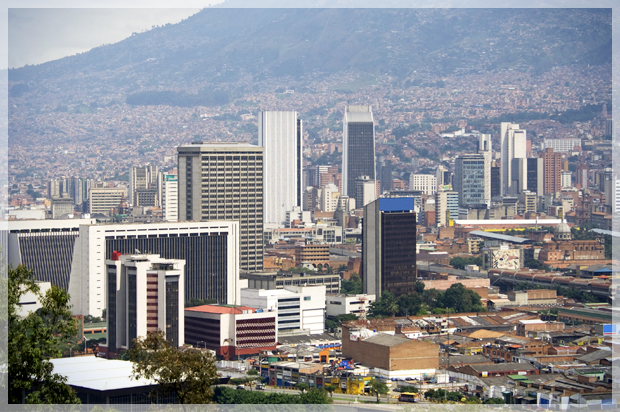 With the Metro system in place, Medellin did increase its readiness for growth and expansion. Indeed, the Metro is a shining example of the resilience dividend: it raises the level of city life above the baseline that residents were accustomed to even a few years earlier. The characteristics of resilience are there: the assertive presence of the Metro demonstrates the city’s awareness of the importance of mobility. The elements of the system are diverse and integrated into the look and life of the place. Yet, even these successful elements of the Medellin Metro system did not reduce the vulnerability of limited mobility and poor access in all the city’s neighborhoods. The San Javier barrio, for example, was still isolated. Yes, the residents had much greater ability to get around the city than ever before—once they walked down the hillside to the rail stations and bus stops in the city below. But the barrio itself remained disconnected. It is a huddle of close-set one- to three-story brick houses that seem almost to perch one on top of the other, their corrugated metal roofs held in place with stones. The narrow streets peter out and become footpaths when the hill gets too steep. Climbing one of the byways into the barrio is more like a mountain hike than a city stroll. Its isolation had made San Javier particularly vulnerable to the disruptions of drug trafficking, crime, and gang warfare. For decades, San Javier had been known as one of the most violent neighborhoods in a violent district in one of the most violent cities in the world. Because of its position, San Javier had become a favored route for drug traffickers in and out of the city. The neighborhood is so densely built, so easy to get lost in, and so difficult to navigate, gangs were able to divide the area into private turfs marked by invisible borders that residents simply had to be aware of—but that police and outsiders usually were not. If you entered the wrong zone at the wrong moment, even with the most innocent of purposes, gang members saw that as trespass. Shoot-outs and street killings were commonplace. And there was very little to stop them. Police and emergency vehicles could not easily negotiate the streets. So, although the city of Medellin was building its resilience through actions such as building the Metro, neighborhoods like San Javier were still vulnerable. As Medellin became more aware of such vulnerabilities and the disruptions they could bring, it became more evident that the threat had to be faced. It could no longer be tolerated as “just the way things are.” Something had to be done before the situation in San Javier exploded and affected the rest of the city’s advancement. As it turned out, the capacity was right there, waiting to be developed. San Javier’s geography made it nearly impossible to bring light rail or bus rapid transit to the neighborhood, but people were used to walking—it was just that the distances were too great. It could take a half hour to get off the hillside. If you held a job across the valley, it might take three hours by foot. How can you still walk but cut your travel time, especially on a steep hill? Escalators. There are a number of versions of the story of how Medellin’s escalators came to be—there are always many parents to a successful idea. The narrative, at various points along the way, involves the efforts of neighborhood residents, city officials, outside agencies, and others. Local mothers’ groups and a team of engineers in the city’s planning department—with nearly ten years of evidence demonstrating that public transit had improved the lives of people in many other parts of the city—figure prominently in the story, as does then Mayor Sergio Fajardo. The idea seemed audacious. Build an escalator system into the hillside of San Javier that would turn a thirty-minute hike into a five-minute glide. Escalators would provide the hillside residents greater mobility, give official agencies much better access to the neighborhood, and better connect the community with the rest of the city, creating new opportunities, economic and otherwise. Like the other transportation solutions the city had built, it would reduce a persistent vulnerability. The mayor, who had a penchant for expansive public architecture and infrastructure initiatives, agreed to an investment in the project that amounted to nearly $7 million. The San Javier escalators, now considered the crown jewel of Medellin’s transportation system (although not actually a part of the Metro system itself ), opened in 2012 in a public ceremony that received international press coverage. Today the tangle of footpaths and lanes has been augmented by a series of six gleaming escalators of the kind you might find in any suburban mall, that climb 1,260 feet up the hillside. They are open to the air on both sides, shielded from the elements by glass and orange-painted metal roofs. We have become so reliant on the Internet as a method of communication, a source of information, and a way to create and maintain social connections that the loss of connectivity is hardly trivial in a crisis. What if we could achieve some degree of connectivity without relying on this global, distributed, open—and highly vulnerable—network? That is the intent of a “mesh network”—a local network of users connected by a series of routers and antennas installed on rooftops throughout a neighborhood, community, or even a small city. The network is driven by its own server and provides access to whatever information is stored there. A mesh network provided connectivity for residents in Red Hook—a neighborhood in Brooklyn—when Superstorm Sandy interrupted connectivity there. The mesh platform also has the potential to be a powerful community-building and networking tool for areas in the developing world that lack connectivity or have limited or unreliable access. The routers (which cost between $50 and $80 each) are installed within view of each other throughout an area and automatically connect to one another and thus expand the network—so users can wirelessly access the mesh software and connect with one another. Although in times of normalcy and in areas of good connectivity the mesh network has its particular advantages (it is a hyperlocal, private network, and thus avoids many of the security issues associated with connection to the World Wide Web), in times of crisis and disruption it could prove a vital lifeline—a backup communications and knowledge-sharing system—keeping community members in touch and facilitating communication that could help people marshal resources and direct first responders to community members most in need. Although it may not be feasible or beneficial to install mesh networks everywhere, those communities most vulnerable to systems breakdown and those with large gaps in connectivity (or those without access to the Internet at all) might consider such a network as an important element in improving readiness. Excerpted from “The Resilience Dividend: Being Strong in a World Where Things Go Wrong” by Judith Rodin.” Reprinted with permission from PublicAffairs. All rights reserved. KIT Capital is an entrepreneur-led merchant bank and family office with primary investment and business development activities in the Andean region of Latin America and the Middle East.